This card was created using all Stampin' Up! products: Kraft & Island Indigo cs, God's Beauty stamps, Versa Mark ink, Watercolor Wonder crayons, Black ep, Crystal Effects, Lace Ribbon Border punch and rhinestones I colored with my marker. 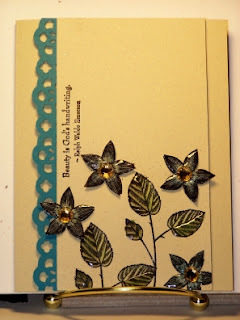 3 of the flowers were stamped 2ce and watercolored then craft cut and raised with dimensionals. Such a lovely card and great take on the inspiration. Thanks for joining us at CASE study.